With the new class series on Yoga for Easing Symptoms of Anxiety and Depression underway, here once again, is a link to a study demonstrating the effectiveness of yoga in this application! Here is the Spring flyer for classes that begin next week! Contact Elizabeth with any questions. Elizabeth’s summer classes continue into the first two weeks of September, after Labor Day. The autumn schedule can be viewed in the flyer here (and above). Please contact Elizabeth if you have questions or wish to register! I will soon send out the email announcing summer classes; here is the flyer for this round (or click on image above). As always in summer, you may sign up for classes that will fit for your summer schedule, and the tuition structure is different than that of the other seasons and quarters! Remeber that Spring Quarter is still in session, and there will be no classes this Monday, Memorial Day. Hope you are enjoying your holiday week-end! Tuesday Morning Yoga Reflection: Bill’s Poem! One Tuesday not long ago, the Turtle Haven morning yoga class was about to begin, and I was on my way out of the house when I grabbed a card with a hand scribed poem from our friend and fellow yogi, Bill Baroch. Bill is also, by the way, Turtle Haven’s trails and grounds landscape artist. I read the poem in class, and was asked by a wonderful student and friend to post the poem on this blog! I thought I would add a few more thoughts, and some of the story behind the wheel…. 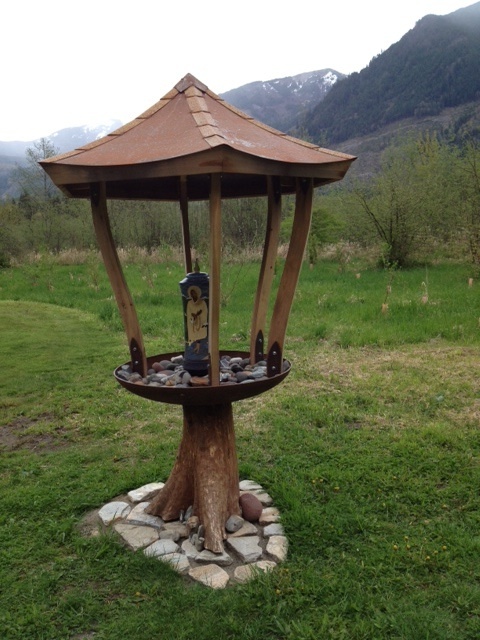 We have on the land, near the labyrinth, this poetic prayer wheel which was created by Chris Moench in collaboration with me, to honor Jillian’s birthday a year and a half ago, the same year she was ordained as an Interfaith Minister. Aaron Westgate and his friend Andy Phillips created a beautiful pagoda-like, earthy and elegant structure to hold the beautiful vessel. I include a photograph of it in this post (above). In recent days, we had a very intimate, small gathering to initiate this blessed addition to Turtle Haven, and Bill brought a poem he had written for the occasion. Since the Tuesday class SEES the wheel, and some go out and visit it, I thought to bring the poem into class— and as I recall, it had to do also with the notion I wanted to speak about that morning, that we need places to go with our our prayers, intentions, joys and sorrows, to bring them out from our own hearts and minds, into some outer form. To speak, mutter, write, or sing them and offer them out…. in this way, a different relationship arises with what we were formerly holding within. In the Gospel of Thomas, as Elaine Pagels and others have pointed out, Jesus is said to have brought this teaching: “If you bring forth what is within you, what you bring forth will save you. If you do not bring forth what is within you, what you do not bring forth will destroy you.” These are powerful words that tell us in a larger sense something of the teachings of the Niyama, and Svadyaya, self reflection, and then bringing ourselves forward into the world, in whatever way is healing and contributes. In rhythm with the turning. Brown leaves settle into damp Earth. New green leaves seek the Sun. The Earth is a Prayer Wheel. The Earth is Prayer Wheel. A veneration. A Holy Communion. The silent sound of salamander steps. We are seeds sewn in dark soil. A flow of people came and went throught the hours of the day yesterday, practicing, reflecting, exploring the labyrinth, making song, sharing a meal, and visiting together in the poignant glow of an autumn hued day at Turtle Haven. I was so touched by each person’s presence, and the warmth and interaction I sensed between and among people, some who knew one another, others meeting for the first time. The day culminated in Paul heartfully calling us to kirtan singing with his kind and open presence. Chris Boerneke brought a guitar and some drums, and we were guided in song by her as well, called towards divine sweetness through her lovely voice and presence! I went out on a limb and played a violin accompaniment to some of Paul’s poetry reading… a new freedom in spontaneity for me. I welcome input as to YOUR interest in community gathering, classes focussed on more than asana—- philosophy, singing, meditation, yoga in healing what ails us and so forth. Our path can be so broad, and so deep, holding and nourishing us beyond even the wondrous ways it can help us to sustain and uplift our physical selves. Community Day – Sunday, October 23! Learn a sequence of yoga breathing and restorative poses to help you feel brighter and lighter in spirit as we navigate the darker days of autumn and winter. Take home a handout with the poses that could be your prescription for a happier few months ahead! We will consider with more depth our relationship to our own desires and how to navigate the inner territories of acceptance, while sustaining our motivation to move forward in our lives.